This was the last show that Saturday (still at Philippine Fashion Week Holiday) and I was excited to see Sassa Jimenez’s collection. I remember Sassa telling me and my friend Bianca Santiago-Reinoso at a recent event that her latest show was going to be completely different. It was kind of hard for me to imagine Sassa going in a different direction because for me, she has always been about pretty, soft and textured dresses. But at the same time, I also wanted to see what other designs she could do. After watching the show I can now agree to what she said, and even say she has explored a darker, edgier side. The overall look I thought was aviator/flying-inspired. 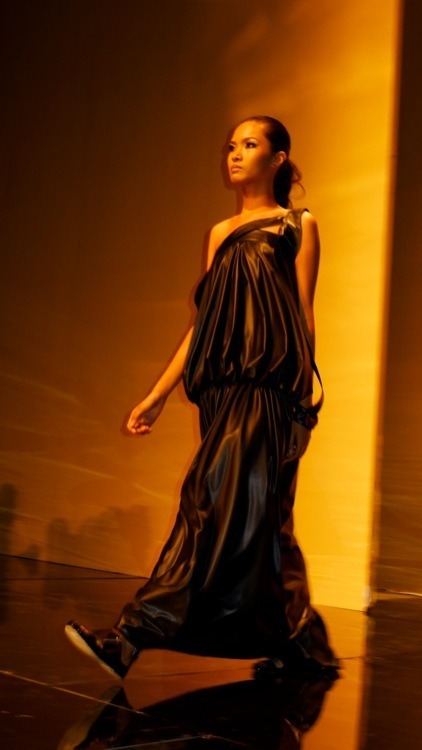 Leather was her choice of fabric for the collection, as she used the material to create long and short dresses, and separates. I really couldn’t imagine wearing head-to-toe leather in this humid weather but I loved the way it looked. I also liked the way it was draped as if it were cloth—it looked very soft and luxurious. Lets see if I can actually wear these pieces: I think Ill start with a top or skirt. Yvonne Quisumbing, on the other hand, delivered a very ethereal collection. Her dresses were very delicate and embellished. Her ram headdresses and giant bead necklaces really added drama to her designs. She is definitely a designer to watch. Here are photos taken at the show. 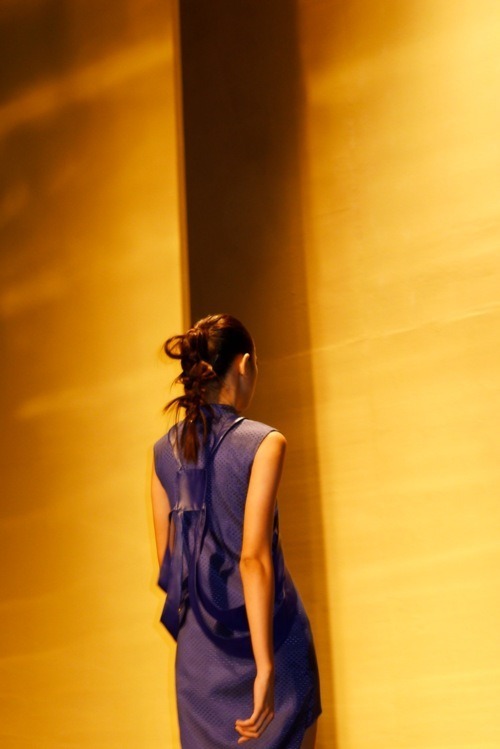 Noticing the undone braid and perforated colored leather dress. Utility jacket + leather dress. Yvonne Quisumbing: Love the texture in this ensemble. The ram headress, huge bead necklace and red Melissa heels. Loving the details in this one.